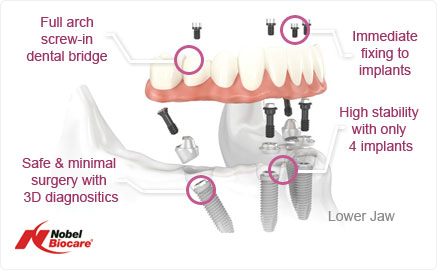 Ideally suited to patients with one or two whole arches of failing teeth or patients who have previously lost their own teeth and currently wear dentures; All-on-4 Dental Implants is a cutting edge, highly effective and affordable treatment option that provides same day new teeth to immediately transform a smile. Here at Fraser Dental Practice, we are proud to restore the smiles of our patients with the All-on-4 Implant System from Nobel Biocare® – an innovative company with market leading dental implant systems of the highest quality. Treatment is carried out by highly experienced dentist Dr Thomas Fraser who has a special interest in surgically placing and restoring dental implants. Tom has a gentle, caring approach and with the experience of placing dental implants since 2007, is able to help put the minds of even our most nervous patients at ease. Same Day Teeth: What Does Treatment Involve? 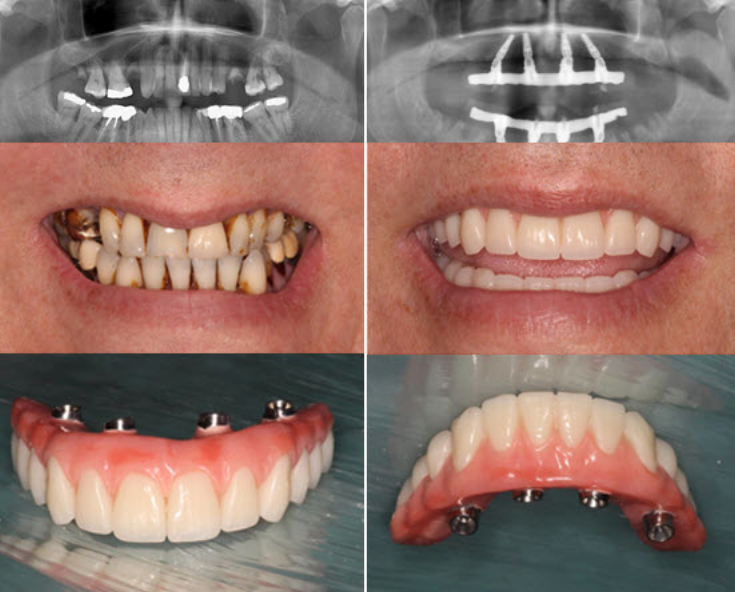 Treatment is completed in three simple steps – firstly the old teeth are removed, next four or five dental implants are placed at strategic positions and angles in the jaw to provide the foundation for the new teeth, and then temporary teeth are fitted; all without the need to leave the practice. Then after 3 to 4 months a fixed, high quality and natural-looking ten tooth bridge will be fitted – so that you can enjoy a beautiful, fully functioning smile for many years to come.